Book abstract: As the author and artist of a heroine’s surreal journey through a haunting southern landscape, Kelli Scott Kelley reveals the mastery of her craft and the strong narrative ability of her artwork. Borrowing from Roman mythology, Jungian analysis, and the psychology of fairy tales, Kelley presents a story of family dysfunction, atonement, and transformation. Reproductions of her artwork—mixed-media paintings executed on repurposed antique linens—punctuate the tale of Accalia, who is tasked with recovering the arms of her father from the belly of the swamp monster. Visually and metaphorically, Accalia’s odyssey enchants and displaces as Kelley delicately balances the disquieting with the familiar. Rich in symbolism and expertly composed, Accalia and the Swamp Monster pulls readers into the physical realm through Kelley’s chimerical imagery and then pushes them towards the inner world of the subconscious. To that end, Kelley’s story is accompanied by essays from Jungian analyst Constance Romero and art historian Sarah Bonner. 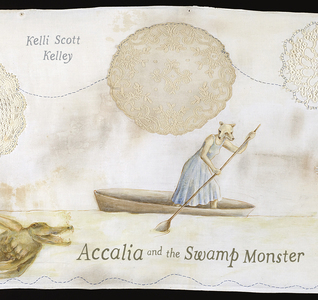 A culmination of nearly a decade of work, introspection, and research, Accalia and the Swamp Monster is both an entrancing display of Kelley’s art and an affirmation of the transformative power of fairy tales.